Sideways. The name of a movie about the great pinot noir. 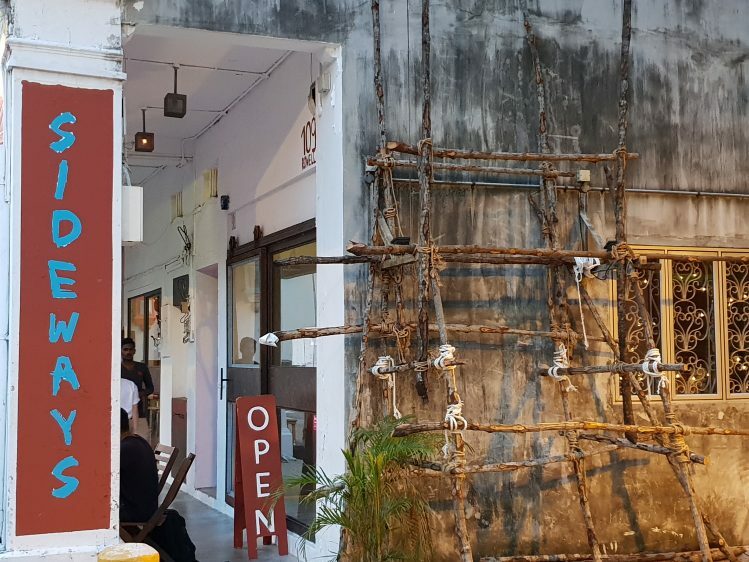 Also the name of a newly-opened restaurant in the Little India/Jalan Besar area. 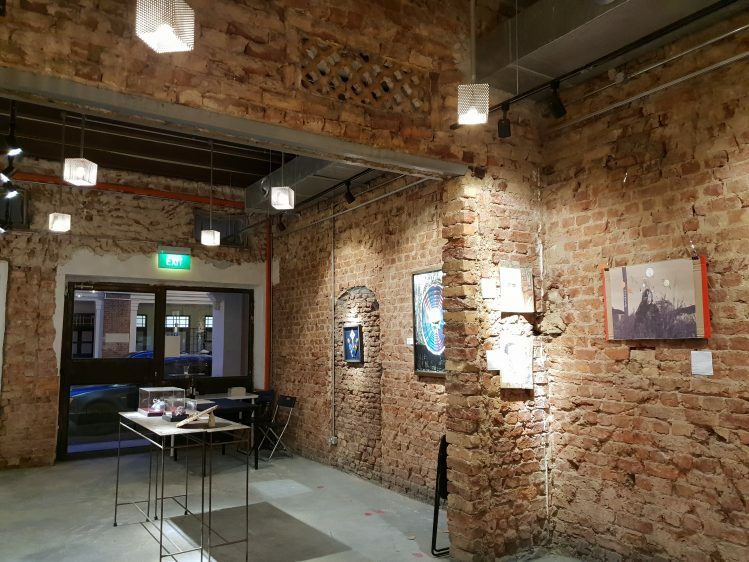 Housed where the fabulous Broadcast HQ used to hang, the place is now half-restaurant, half-gallery – all in a bricked-up space that exudes an industrial yet cosy vibe. 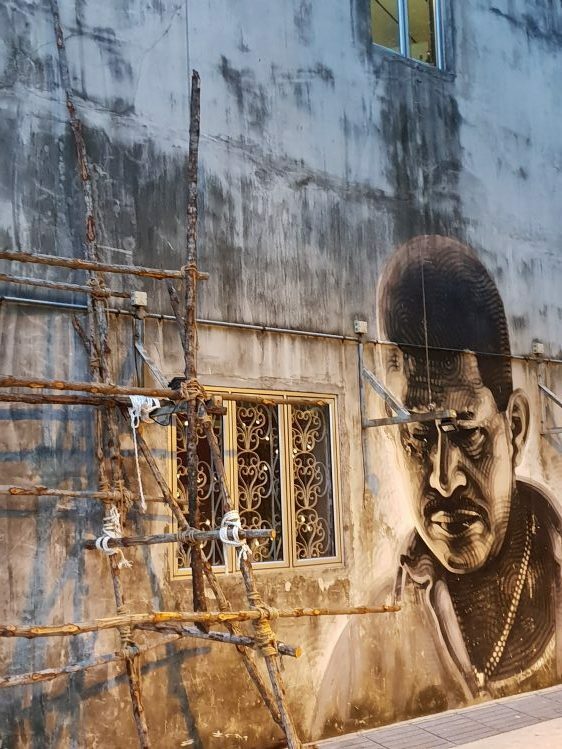 The mural at the side of Sideways. Walk further along and you will stumble into Little India’s famed red-light district! I say cosy only because of the small and dark space, not so much the “wow, you make one feel so welcomed in your lovely little restaurant” kind of way. Ok, perhaps I am being unfair. I think I have this misplaced expectation that when a place is so charmingly small and homey, and coupled with the fact that messages over Facebook (where you could get lulled into a false sense of familiarity) is becoming the norm of restaurant communications these days, I guess I expect to be greeted like an old friend at the door. But that’s ok. 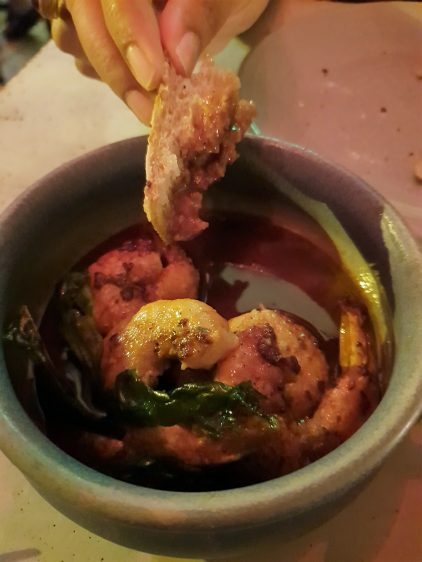 The enthusiastic flavours in the food at Sideways is enough to warm me right back up. Not to mention the working art piece of the restaurant, the built-from-scratch wood-fired oven. 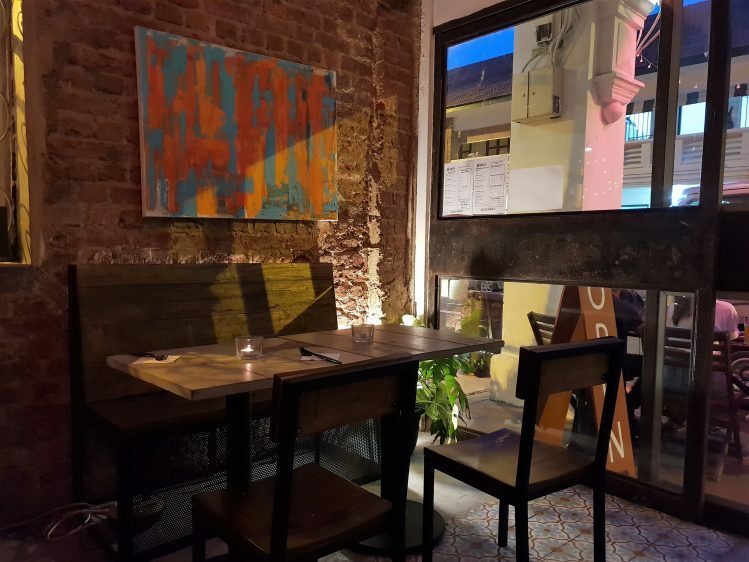 The menu is suitably petite, and absolutely not lacking in interesting-sounding small plates. 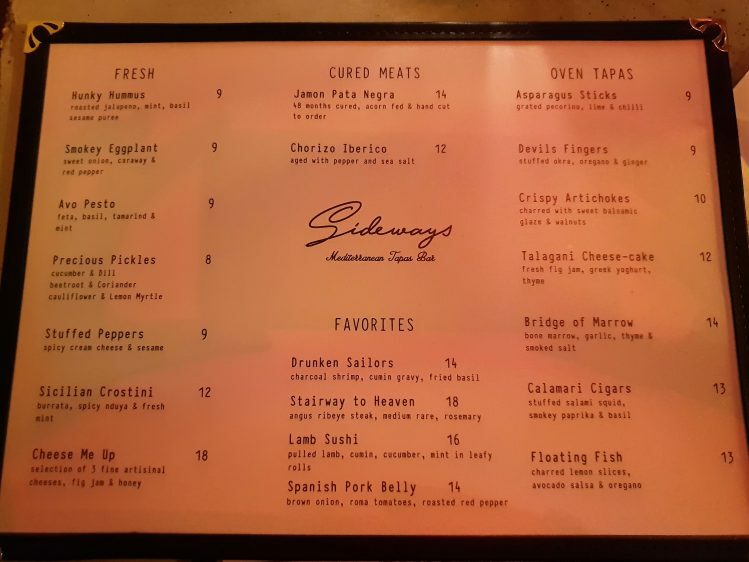 Items like the Sicilian Crostini with its burrata, spicy nduya and mint, and the Calamari Cigars which is stuffed salami squid, paprika and basil enticed but it was just my hubby and I, and we were hell-bent on trying the rib-eye so we had to choose wisely. 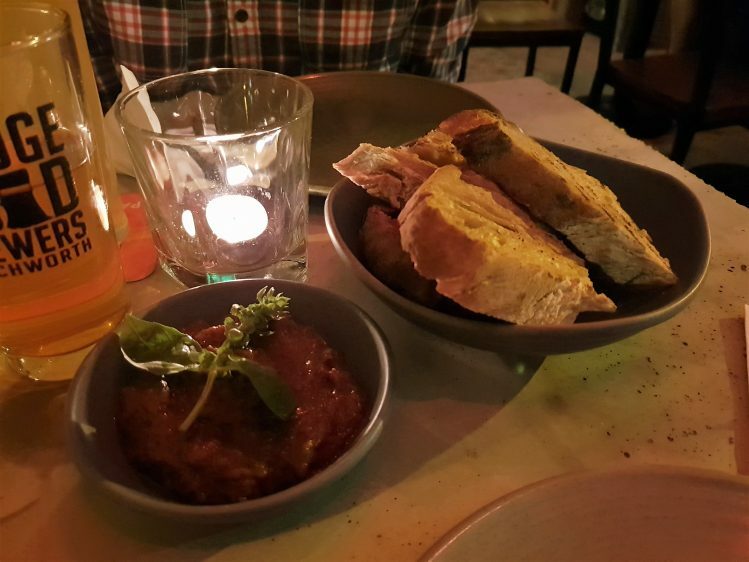 Being sourdough lovers, and having read about their sourdough, we had to order a portion ($4 for 4 slices) and some dips to go with that. It was a toss-up between the jalapeno and sesame-pureed Hunky Hummus and the caraway-infused Smokey Eggplant ($9), we chose the latter in the end. Mmm, the start of the delights of smoking! Your food, that is. Then a smoky, spicy twist on the Spanish gambas/olio tapas, the Drunken Sailors ($14) came along. I don’t need to tell you the joys of soaking up the garlicky, cumin-spiced oil with said sourdough bread. 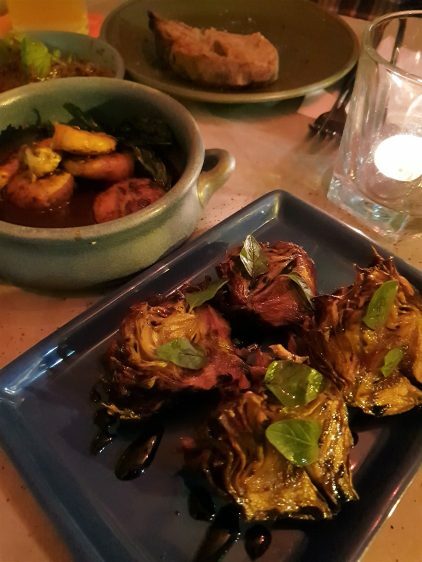 Artichokes ($10) are only ever a hit for me when they are dressed up fine – and at Sideways, they sure are befitted well, charred with balsamic glaze and fried, they were quite the delight, indeed. 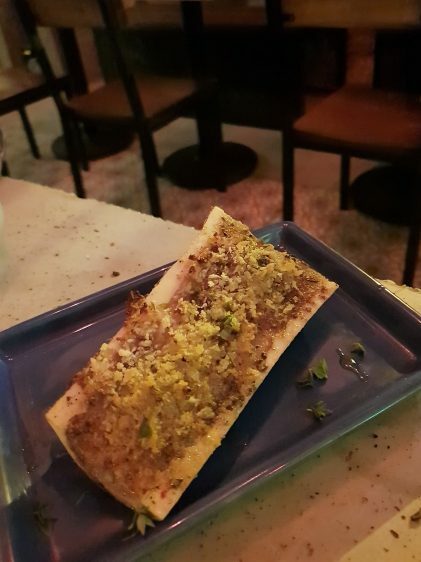 Likewise, Bone Marrow ($14) – many of which I have had elsewhere, and when not helped along with other strong flavours, end up being a lame lump on my plate. This one was like the classic French baked escargot – topped with a thyme, garlic and breadcrumb mixture. Perfect. Then what we were trying to save room for, the Stairway to Heaven which is Sideways’ grilled Ribeye. Sliced and best served medium-rare, you can taste the full flavours of the meat and the rosemary marinade comes through strong. 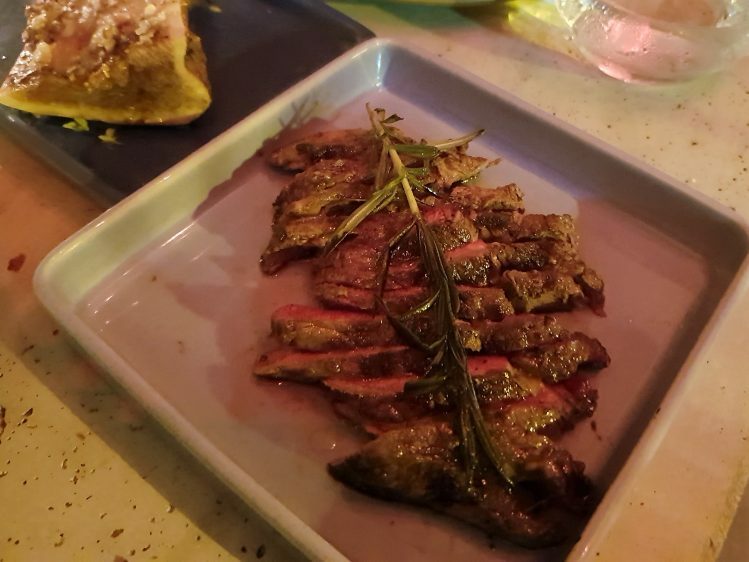 The actual cut of the meat, well, you get what you pay for – the dish is just $18, so don’t expect the finest cut, obviously. Overall, I appreciate the rich flavours of the dishes, the interesting executions, so yes, I will be quite happy to slide back in Sideways.